The Porsche 911 has been a standard for hip-hugging international sports car driving, well suited for European roads of the open Autobahn and the curves of the Alps. However, the latest General Motors Corvette seems to be representing a maturity in American car design that is creating a bona fide American challenge to the German standard. The latest Corvette model is only three inches longer in length than its German peer, and under the hood both cars punch out 60 mph in less than 4 seconds (the Corvette is 0.3 seconds faster than the base Porsche 911). Upgrade the 2017 Corvette to the Z06 version, and now the Porsche is running against a car that puts out 650 horsepower with a 6.2 liter engine block rated a V8. Both cars come as standard frames or convertibles, and the riding interior is really only designed for the driver and a passenger, even though the Porsche has a bit more room in the back for one of Santa’s elves, maybe. A big notable change, however, is that the Corvette’s handling has been significantly improved. 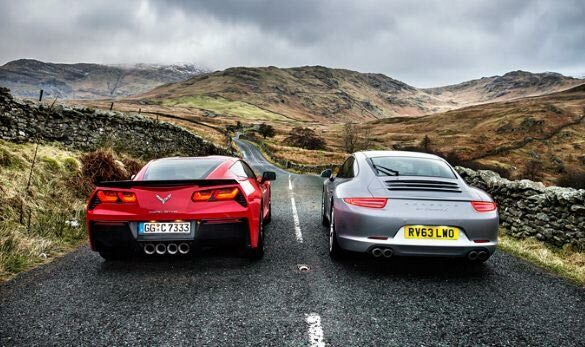 It won’t exceed the Porsche, but now its on the same field; a huge jump up for GM.